SI Precast has joined Submar in its effort to stop the corrosion of pipelines by manufacturing over 500 erosion control concrete revetment mats per year. 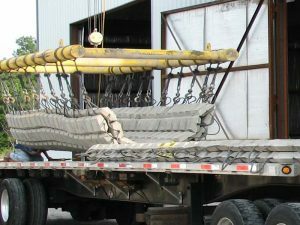 Currently, these mats are being manufactured in San Antonio and Beaumont, Texas but have also been manufactured in Shreveport, Louisiana in the past. Submar has been designing, manufacturing, and installing erosion solutions for over 30 years. Their erosion solutions range from offshore pipelines to onshore pipeline protection and site stabilization. Held together by a series of cables, these flexible structures cover a wide variety of landscapes to ensure the protection of vital pipelines, and the environment that surrounds them. 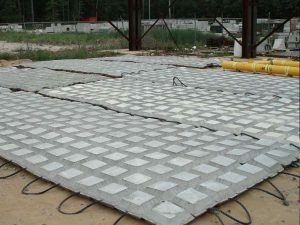 Submar erosion control mats are used to protect onshore pipelines from erosion. The flexible concrete structures are placed over the underground pipeline, allowing water to flow over them without eroding the pipeline underneath. These revetment mats can also be used to reinforce embankments, protect shorelines, and restore wetlands. The revetment mats are a longer lasting solution to erosion than traditional alternatives such as structural concrete, gabions, and riprap. Weighing in at 6200 pounds, these 8’ x 20’ mats are made to withstand hazards including extreme temperatures, sunlight, and saltwater erosion. These erosion control mats truly combine versatility with durability. While these pipelines are responsible for the distribution of gas and oil, they are also a pollution liability if not protected correctly. By manufacturing and installing these revetment mats, SI Precast and Submar are helping to ensure the protection of the environment, as well as creating a long term solution to a prevalent and dangerous problem. To learn more about this product, visit the Submar website.